Grilled or crispy chicken, lettuce, cheese, tomatoes, bacon and ranch dressing. 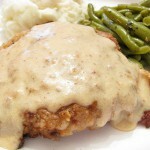 Lunch size hand breaded chicken breast smothered with cream gravy. Served with two sides and Texas toast. 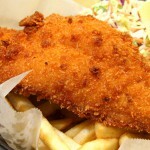 One deep fried catfish fillet served with fries and coleslaw. Lunch size spaghetti with our homemade meat sauce served with a dinner salad. Lunch size hand breaded sirloin steak smothered with cream gravy. Served with two sides and Texas toast.